Nickolay Mladenov, Special Coordinator for the Middle East Peace Process (on screen) briefs the Security Council via video conference. The United Nations envoy for the peace process in the Middle East today warned the Security Council that, as circumstances on the ground continue to deteriorate, lamenting the disappearance of a negotiated two-state solution has become a “default narrative” for many. “The will to advance towards peace clearly exists. What remains glaringly absent is the political will and bold leadership to make genuine progress a reality,” said Nickolay Mladenov, Special Coordinator for the Middle East Peace Process, in a briefing to the Security Council at New York Headquarters this afternoon. “We need collectively to ask ourselves whether those Israelis and Palestinians who today support a return to negotiations will continue to do so next year, or two years from now, if the prospects for peace remain out of reach. Prolonging the current impasse will sap any remaining optimism for finding a solution to the nearly 50-year occupation,” he added, citing a recent study conducted by Tel Aviv University, which shows that close to 60 per cent of the Jewish population and more than 70 per cent of Palestinians remain in favour of conducting peace negotiations. The envoy underscored that over the past decades, a broad consensus has been built around the understanding that the Palestinian-Israeli conflict can only be resolved through negotiations and on the basis of a two-state solution. Indeed, this consensus is at the core of the work of the Middle East Quartet – the European Union, Russia, the United States and the UN, which continues to work with the parties and the region to bring about the necessary conditions for the resumption of meaningful negotiations and is finalizing its first report on the impediments to the two-state solution and the way forward, he said. Mr. Mladenov noted that in a few days, several countries and Secretary-General Ban Ki-moon will come together in Paris to reaffirm their commitment to a negotiated two-state solution and to discuss how they can constructively support both parties in achieving this goal. “All these efforts, important as they are, cannot be divorced from the stark reality on the ground that is affecting the lives of Palestinians and Israelis alike,” he stressed. The envoy said that despite a general downward trend in violence, on 18 April a Hamas-affiliated Palestinian teenager detonated a bomb on a bus in Jerusalem, injuring 21 people, several of them seriously. “I reiterate the UN's firm conviction that there can never, under any circumstances, be a justification for acts of terror,” he said. He went on to say that days later, on 27 April, a pregnant, 23-year-old Palestinian mother and her 16-year-old brother were shot and killed under “questionable circumstances” at a checkpoint close to Jerusalem, reportedly by Israeli private security contractors, after allegedly attempting to carry out a knife attack against Israeli security forces. Noting that Palestinian eyewitnesses refuted the claim and that the case has once again raised concerns about the need to calibrate the use of force, the envoy said that Israeli authorities have initiated an investigation, and encouraged them to conduct it in a swift and transparent manner. Mr. Mladenov said that the beginning of May saw the biggest escalation of violence between Israel and Hamas since the 2014 conflict. Two tunnels were discovered and Israel carried out 14 incursions into Gaza to destroy them and seek out others. In the violent exchanges that followed, militants fired 40 mortars and eight rockets at Israel and the Israel Defense Forces conducted 13 airstrikes on targets in the Gaza Strip. In addition, a Palestinian woman was killed by shrapnel and several others were wounded, the envoy said. “These incidents in recent weeks underscore the fragility of the security dynamics on the ground, particularly the threat to the ceasefire in Gaza, which needs to be vigorously upheld by all sides if we are to avoid slipping into another devastating conflict,” the envoy said. Against this backdrop, the Ad-Hoc Liaison Committee met in Brussels on 19 April and expressed concern over the damaging consequences of the current political impasse, the importance of preserving the two-state solution, and the sharp decline in donor aid to the Palestinian Authority, Mr. Mladenov said. “I am encouraged that both sides agreed to work with donors over the coming two years to build a more sustainable Palestinian economy by reducing the budget deficit and stimulating long-term economic growth,” he said. The envoy also emphasized that as Palestinians face mounting financial and institutional challenges, negative developments continue in the occupied West Bank, including East Jerusalem. “Talks between Israeli and Palestinian officials on security arrangements for Area A have all but reached an impasse. I urge both sides to continue to work to bridge existing gaps,” he said. The envoy also noted the continuation of demolitions of Palestinian structures in the West Bank. While the pace has somewhat slowed compared with last month, the number of structures that have been demolished or confiscated across the West Bank in 2016 exceeds the total for all of 2015, and at least 900 people have been displaced, he said. Although many of the structures that have been demolished are not dwellings, the loss of water wells, solar panels and animal shelters has impacted the livelihoods of more than 2,500 people, the envoy said. “We in the international community have a responsibility not to fail the Palestinians in Gaza, to help them recover from the physical and emotional traumas of war, to assist them in rebuilding their lives and livelihoods and, ultimately, to see Gaza and the West Bank reunited and the closures lifted,” he said. Mr. Mladenov recalled that in early April, Israel suspended private import of cement following the diversion of a substantial amount from its intended legitimate beneficiaries. After 45 days and “intense efforts” by the UN team on the ground, the suspension was lifted, he said, adding that all sides must ensure that cement is used solely for civilian purposes. 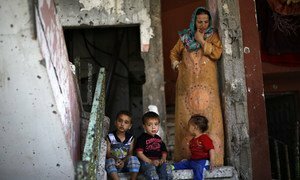 In addition, the envoy stressed that Palestinians in Gaza are “growing ever more desperate,” seeing their prospects for living a normal life and recovering their economy blocked by Hamas's military build-up, Israel's security measures and closures, the lack of Palestinian unity, and the insufficient fulfilment of aid pledges by donors. “Recent events clearly demonstrate that the spectre of violence looms ominously over the territory. Unless radically more is done to address the chronic realities in Gaza, it is not a question of 'if', but 'when' another escalation will take place,” he said. In addition, Mr. Mladenov said that in a “most worrying recent development,” Hamas had announced their intention to implement a number of death sentences. “International law limits the application of the death penalty to the “most serious crimes” and pursuant to a trial and appeals process that scrupulously follow fair trial standards. I have serious doubts as to whether capital trials in Gaza meet these standards,” he said. Lastly, Mr. Mladenov welcomed the recent statement by Egyptian President Abdel Fattah el-Sisi expressing Egypt's readiness to mediate a reconciliation between rival Palestinian factions so as to pave the way toward a lasting peace agreement with Israel. “His call also to Israelis and Palestinians to continue the historic step towards peace taken by Israel and Egypt 37 years ago must not go unheeded, not in Israel, not in Palestine, and certainly not in the Arab region,” the envoy said. “I urge Palestinian leaders in Gaza and the West Bank to take up this opportunity and to deliver, at long last, to the Palestinian people an end to the issues that divide, and a commitment to strengthening the ties that bind them. And I also urge Palestinian and Israeli leaders to engage, through the initiatives that have been put forward, to bring a just, comprehensive and enduring peace to the people of Israel and Palestine,” he said. The United Nations envoy for the peace process in the Middle East today warned the Security Council that the prospects for an independent Palestinian state are disappearing, and questioned the political will of the Israeli and Palestinian actors to address the main challenges blocking peace efforts.